Trump-style candidate our only hope . . .
“political correctness” . . . one of the most dangerous intellectual afflictions ever to attack mankind. The fact that we began by laughing at it–and to some extent, still do–doesn’t diminish its venom one bit. PC . . . appeals to pseudo-intellectuals everywhere . . . . Any empty-headed student with a powerful voice can claim someone (never specified) will be “hurt” by a hitherto harmless term, object or activity and be reasonably assured that the dons and professors in charge will show a white feather and do as the student demands.
. . . [T]here isn’t a university campus on either side of the Atlantic that’s not in danger of censorship. The brutal young don’t even need to impose it themselves; their trembling elders will do it for them.
. . . usually the anonymous work of such Kafkaesque figures as civil servants, municipal librarians, post office sorters and employees at similar levels . . . the revenge of the resentful underdog. From the early 17th century, when the clerical discipline the Pilgrim Fathers sought to impose broke down and those who had things to say struck out westward or southward for the freedom to say them, America has been a land of unrestricted comment on anything–until recently. No one could be a bigger contrast to the spineless, pusillanimous and underdeserving Barack Obama, who has never done a thing for himself and is entirely the creation of reverse discrimination. The fact that he was elected President–not once, but twice–shows how deep-set the rot is and how far along the road to national impotence the country has traveled. Under Obama the U.S.–by far the richest and most productive nation on earth–has been outsmarted, outmaneuvered and made to appear a second-class power by Vladimir Putin’s Russia. America has presented itself as a victim of political and economic Alzheimer’s disease, a case of national debility and geopolitical collapse. None of the Republican candidates trailing Trump has the character to reverse this deplorable declension. The Democratic nomination seems likely to go to the relic of the Clinton era, herself a patiently assembled model of political correctness, who is carefully instructing America’s most powerful pressure groups in what they want to hear and whose strongest card is the simplistic notion that the U.S. has never had a woman President and ought to have one now, merit being a secondary consideration. The world needs a scare. The world is disorderly and needs its leading nation to take charge and scare it back into decency. Donald Trump fits the bill. Other formidable figures, including Dwight Eisenhower and Ronald Reagan, have performed a similar service in the past. But each President is unique and cast in his own mold. Trump is a man of excess–and today a man of excess is what’s needed. The whole argument made by the prolific journalist and popular historian Johnson is clearly based on a keen appreciation of how bad things are which I share. For his editor (of Standpoint) son Dan Johnson, by the way, the Donald Trump solution is not recommended. Why does Univision’s man on horse bother about Trump? 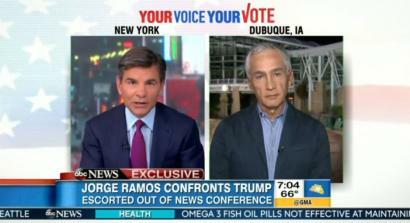 JORGE RAMOS: Nationwide he doesn’t have the Latino vote and without the Latino vote, he cannot make it to the White House and he’s realizing that. You know, let’s talk in a year from now, let’s see first if he becomes the nominee and if he becomes the nominee he’s going to be pleading for the Latino vote because without the Latino vote, without 60 million that will go to the polls in 2016 he can’t make it to the White House, and he knows it. However: If he’s not gonna win, why bother about him? Or does Ramos mean he’s not gonna win if Ramos bothers about him? The civilized world depends on Ramos!